Serious. Pink. Power fuel. 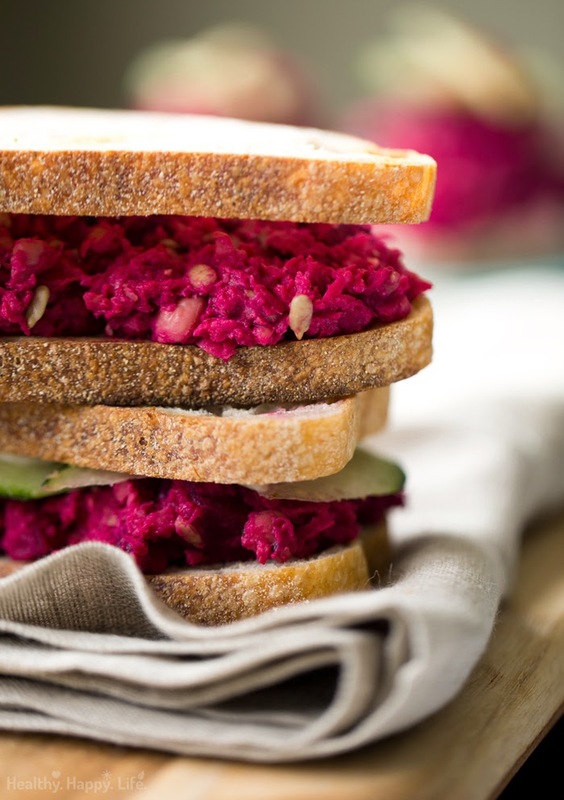 I'm turning up the beet and putting a pretty-in-pink spin on my favorite smashed chickpea sandwich. 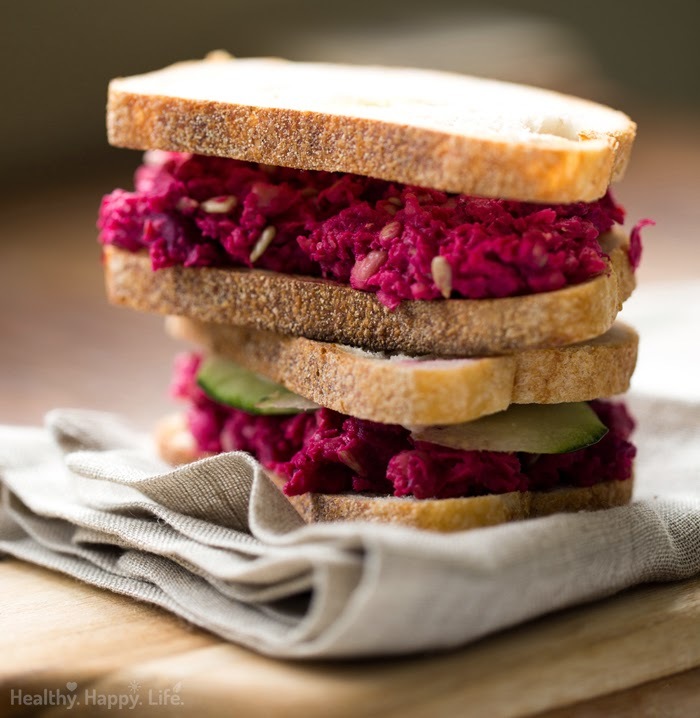 Today's Pink Chickpea Smash Salad Sandwich is super easy to make and big on flavor, texture and nutrition. Whip it up for lunch as a sandwich, scoop it onto a large entree salad or simply eat it by the spoonful any time of day. 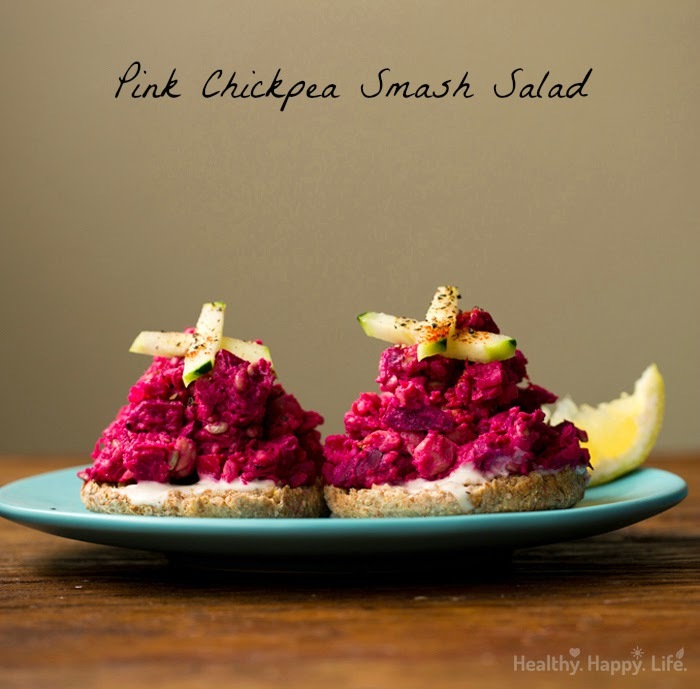 Pink power is calling you..
Chickpeas are a vegans best friend. They are rich in fiber, a good source of protein, vitamins, iron and more. They have a nutty lovable flavor. And they are used to make one of our favorite go-to recipes: hummus. 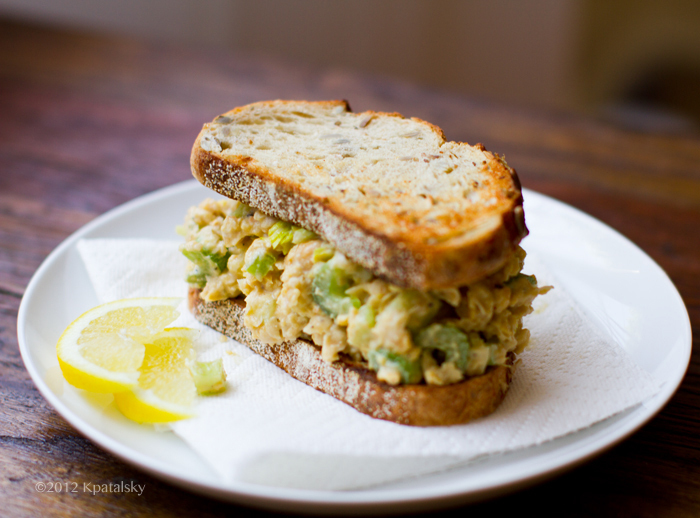 They also can be smashed to make a chickpea salad that is simply amazing. This PINK smashed salad is an unBEETable creation that not only looks fun and pretty, but tastes super. 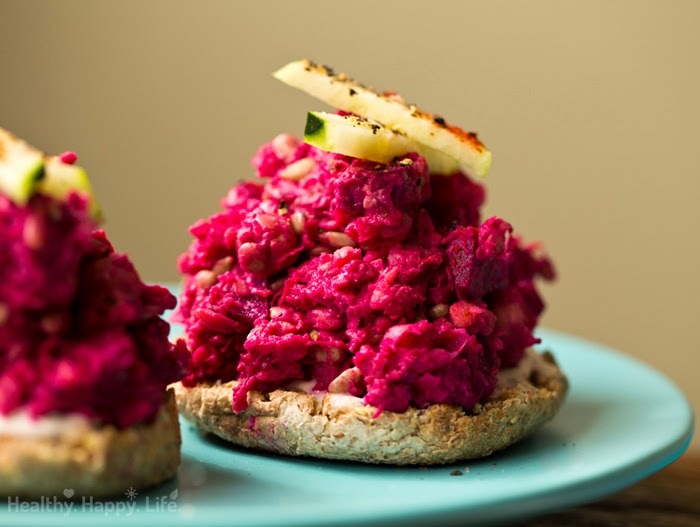 I want to stress that even if you think you do not like beets, give this a try! Raw beets have such a mild, sweet flavor that you can barely taste them really, you can just boldly SEE them in all that pink. 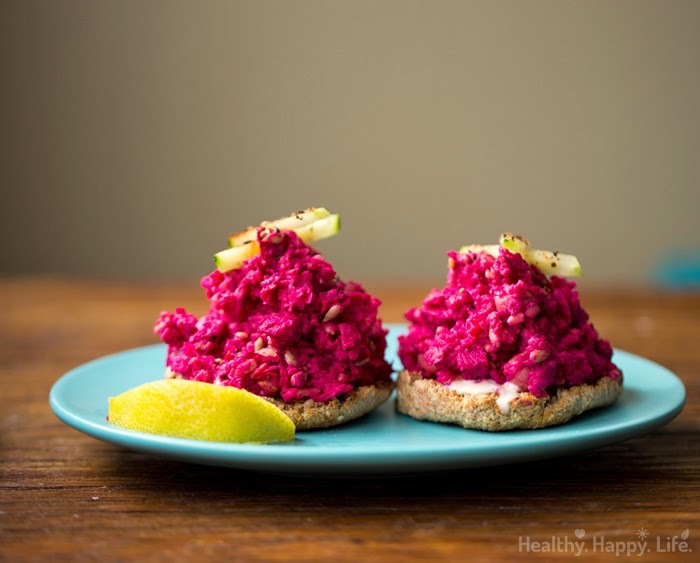 Beets add texture, a hint of sweetness and loads of crunchiness too. I also add in some roasted (or raw) sunflower seeds for nutty flavor, texture and saltiness. To Serve. 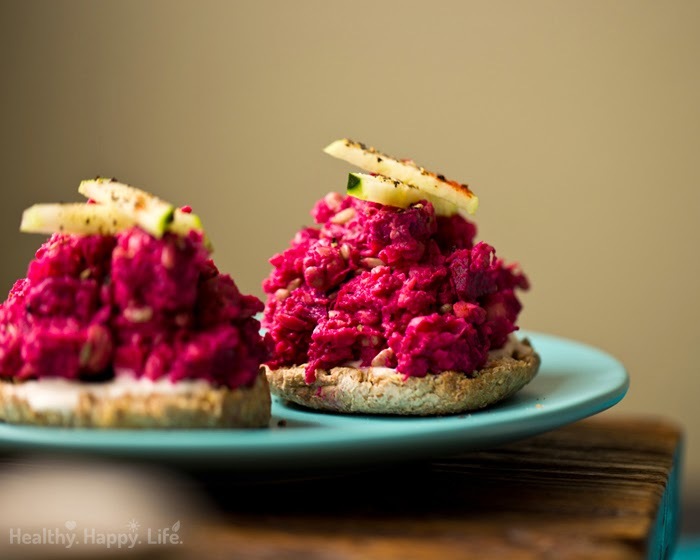 I spread a bit of dried dill + vegan mayo on sprouted grain English muffins by Foof for Life. Then added a few cucumbers and smoked paprika. On the closed face sandwiches, I added sliced cucumbers and vegan mayo. Feel free to add carrots, veggies, anything you'd like really! 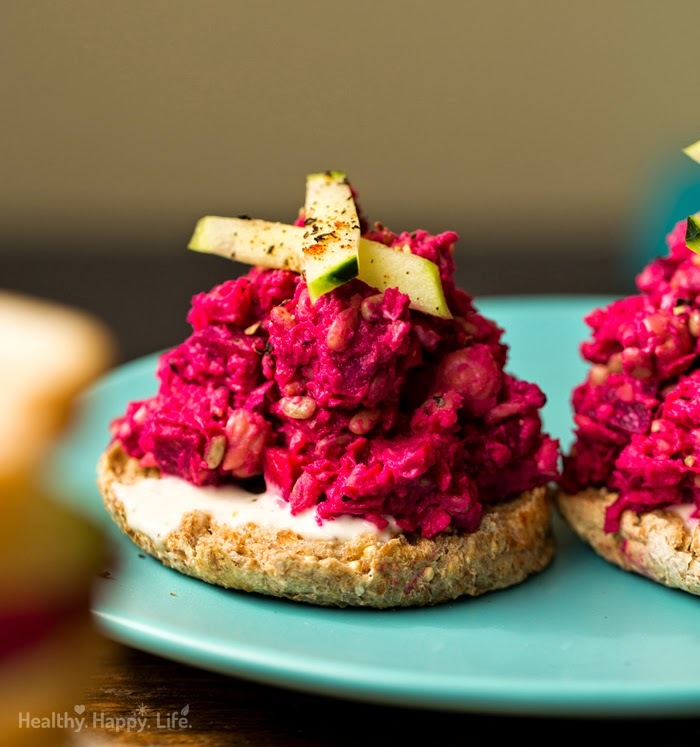 Get your hands pink and make this for lunch or dinner!.. 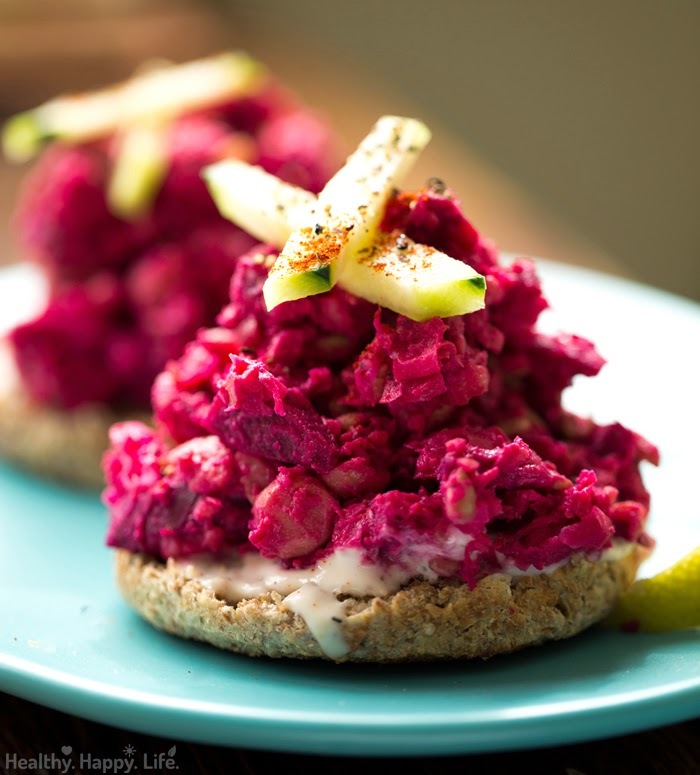 This vegan lemon and beet smashed chickpea salad can be used for sandwiches, pitas or scooped on top of salad. Drain and rinse your cooked chickpeas in hot water. Using hot water allows them to soften and easily be smashed with a fork. The hottest water from your tap will work. Add the chickpeas, lemon juice and tahini to a large mixing bowl. Using a fork, smash the chickpeas until about 80% of them are mashed, you can leave a few beans whole for added texture. Add the grated and chopped beets and fold well. Fold in the pepper, sunflower seeds and salt to taste. If desired, add additional spices like smoked paprika, nutritional yeast and cayenne. Serve right away or chill in the fridge, covered, until ready to serve on salads or sandwiches.